This is part of a series of blog posts that is inspired by our baby daughter, Miru. It is well known that babies have a sonic prehistory that starts in the womb, and advice to comfort a baby often includes exposing her to white noise similar to the audible sensations she had while in utero. There appear to be devices for sale that reproduce the sounds of the womb, rocking cradles with battery-powered baby tunes that once drained play their simplistic jingle with a squeaky and unnerving high pitch. I have a hypothesis. What if babies understand sounds much better than we assume? After all, they had a lot of time to learn, and we all know the cliché of the zealous mother who plays Mozart to her pregnant belly. What if a baby, who seems to be completely absorbed by her reflexes when she is crying, can be talked to in her own language – while she is crying? 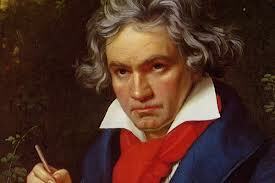 What if we imitate the baby’s moans and groans with our own voice, but turn it into something rhythmical, like Beethoven’s 9th. Ridiculous. But I tried it, and, although it is no panacea for consoling infants, Miru seemed to react to my singing, and it helped to at least temporarily tone down some of her cries. We hear our own voice through bone conduction, and since the baby’s skull is rapidly developing, this is already a profound experience for her. What if her fledgling vocal exertions are not only played back at her through her fontanels, but also from a source independent of her body? She seems to realize the fact that the same sound she is producing is also coming from her daddy, who is humming familiar tunes using her tone (but is terribly off-key) while bent over her crib. This fact, that the world she just experienced as strange and hostile, a sentiment she vented – and constituted – by forcefully expelling air through her vocal cords, is in fact a world where her deepest anxiety has occasionally been turned into a melody that gives it a home? That the tone of her cries and whispers resonates not only in the echo chamber of her own little chest, but belong to the world, a sentiment perhaps that like no other reassures her that she belongs there, too. Back to normal parenting. The “theme song” for our baby (alright, there are many) is “yiri yiri boum“. While playing it, we drum the rhythm with her legs. And she smiles. Life is beautiful.